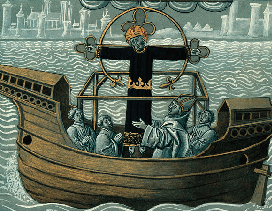 The lignum crucis, that is, the wood of the Holy Cross, which had an enormous importance not only in the Christian worship but also in the whole Western imagery, is a relic strictly connected to the pilgrimages in the Holy Land. The tradition of its legend has a precise origin, in the Latin Middle Ages. The story was told in the Legenda Aurea by Jacopo da Varagine who, as he himself claimed, had collected it from other preceding authors. Once Empress Helena, the mother of Constantine, had arrived in Jerusalem, she asked the local authorities wether they knew where the cross of the Passion of the Christ was. Only a man called Jude knew where it was and, after he was forced to reveal it, they dug in the place he indicated and they found three crosses, which were consigned to the Empress. Then, as, according to the legend, no one could distinguish which of the three was the Holy Cross, they placed them all in the main square in Jerusalem, waiting for the glory of God to reveal itself. But then a young dead man was brought on the place: each cross was placed on his dead body but it was only with the third that he came back to life. Le Legenda Aurea is a collection of the lives of the saints wrote by the Dominican Jacopo da Varagine around 1260, which was probably used as a preaching manual. In the late Middle Ages the Legenda was translated into many European languages, including French. The most important translation was the one realised around 1333 by Jean de Vignay: sixteen miniatured manuscripts of this translation survived. It was in this translation that the legend of the Holy Face of Jesus, which had such an important influence during the Middle Ages, became part of the Legenda Aurea. The Holy Face of Jesus of Lucca was well known in Northern Europe and it was an object of devotion of the French nobility in the Late Middle Ages. When the festivity of the Exaltation of the Holy Cross, celebrated on 14th September in memory of the recovery of the Holy Cross of Jesus, became part of the liturgic calendar, the legend of the Holy Face of Jesus was introduced in the collection. In fact, the Legenda Aurea originally recorded only the lives of the saints, ordered according to the liturgic calendar. The festivity of the Exaltation of the Holy Cross originated in Jerusalem in the first half of IV Century. Since the consecration of the great basilica on the Calvary on 13th September 335 AC, annually, on 14th September, a particular rite was performed, during which a relic of the Holy Cross was raised with a gesture of “exaltation” in order to be displayed in front of the worshipping believers. A similar festivity spread in the Orient and in the Western world from the liturgy of Jerusalem. In Rome it had already been celebrated since VII century, whereas in Milan it became an official celebration only in XI Century. In Lucca it was expressed in the legend and in the cult of the Holy Face of Jesus and it became the emblem of the town identity. The pilgrimages to Jerusalem during the Middle Ages influenced deeply the architectural development of the Western word, not only through the many imitations of the Holy Sepulchre but also through the diffusion of relics, cults and sanctuaries which were strictly connected to the imagery of the Holy Land. Thus, Lucca, thanks to the legend of the “acheropoieta” (that is, an image of the Christ made without hands), can be considered a sort of bridge, placed in the heart of Italy, between the Orient and the West. On the other hand, the European pilgrimages, which often originated from the experiences in Jerusalem, contributed too to the diffusion of local cults and traditions which soon became popular and important. In fact, it was through the pilgrimages that the West knew about the Holy Face of Christ in Lucca. This cult must be connected to the phenomenon from which it originated and to the ones it consequently generated. The city occupied a strategic position along the Francigena road, the Italian road which was created during the Early Middle Ages after the great Roman streets which ran along the Tyrrhenian coast- particularly the Aurelia one - were abandoned. In fact, due to the depopulation and the lack of safety the main roads moved towards the inland. The Francigena road was the main road connecting Rome and Santiago de Compostela. This was one of the reasons why the cult of the icon of Lucca soon acquired an incredible popularity. In XI Century, William the Red, duke of Normandy and King of England, vowed on the “volt the Lucha”. According to an episode of the epic poem “Chevalerie Ogier” (end of XII Century- beginning of XIII Century) when Charlemagne passed through Lucca, while he was running after Uggeri the Danish, practiced his devotions in front of the “santo Vou” in Saint Martin’s Church. Until a few decades ago, the scholars knew these episodes very well, as they enriched with interesting anecdotes the conversations among the learned people in the last two centuries. Unfortunately, they mostly got lost. This project, thus, aims at retrieving all the materials about the Holy Face of Christ in order to make them available again to the public. One of the main purposes of this project is trying to establish a relationship between the great roads involved in the pilgrimage routes and a local cult like that of the Holy Face of Christ which, as previously underlined, must not be considered only as a phenomenon of Lucca. Thanks to its position on the great routes to Rome and to France, the crucifix in Lucca became an important relic in the Late Middle Ages religious landscape. From the conceptual point of view, it represented a junction between the main pilgrimage routes of the time. There were three “peregrinationes maiores” (that is, main pilgrimages) in the Middle Ages: Jerusalem, Rome and Santiago de Compostela. Their importance was connected to the value of the relics which were kept in each one. For this reason, the Holy Face of Christ represented an eminent pilgrimage, much more important than a simple local cult as it is often considered currently. The extent and the complexity of its distribution can be clearly understood through a simple iconographic research. For this reason, this project must be considered still under development, in the hope to reinforce the research on this topic with the necessary interventions.